Some things are worth melting for, and your heart is sure to melt over this Brand New Silly Frozen Olaf figurine! 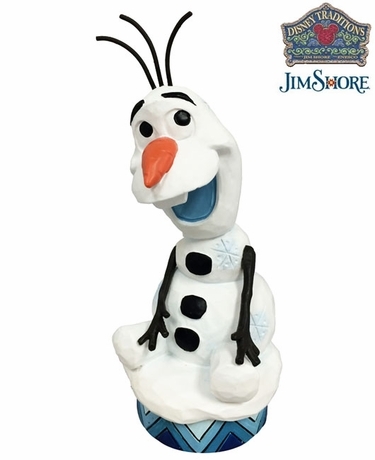 Masterfully crafted from stone resin with wire accents, this 5" tall figure blends the charm of Disney's Olaf from Frozen with Jim Shore's remarkable artistry for a gift that is sure to inspire a few warm hugs! Your Disney Frozen fan will never want to let this keepsake go! Beware of imitation knock-offs flooding the market! Our officially licensed figurine comes with the authentic Disney Traditions tag, and is delivered in the signature Red Disney Showcase Collection Box - 100% Authentic. Stamped on bottom and includes 4 scratch proof felt pads for display. Most importantly, our authentic Olaf is white like snow with hints of blue - not a dirty off white.